Can you get a low-carb take-away? Or go out for dinner and stay on your low-carb diet? Eating out on a low-carb diet is definitely possible. You just need to choose your food carefully. Most restaurants serve meat, poultry or fish dishes (except vegetarian venues). Be careful when choosing starters, side dishes and sauces. Obviously, avoid the bread basket and any sugary desserts. Below is a quick guide to popular ethnic cuisines, and protecting yourself from carb exposure when eating out. Stay away from rice and noodles, dim sum, wontons, pancakes, spring rolls, prawn toast, anything in batter, sweet and sour sauce, oyster sauce and sweet dips. Clear soups are a good option for starters. Choose one without wontons. 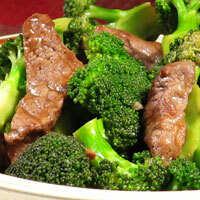 Go for whole meats with minimum sauce like Hong Kong duck, roast pork or broccoli beef. Order vegetables as your side dish instead of rice, for example, shiitake mushrooms, bean sprouts, bamboo shoots and Chinese greens. Avoid poppadoms, naan bread, rice and pastries like chapatis and samosas. Standard Indian curry sauce is made from tomatoes and onions, but sugar is often added to improve the taste, so it’s safer to avoid those too. The best option would be tandoori grilled meat like lamb shashlik or king prawns, and a vegetable side like fried mushrooms, okra or eggplants. Restaurant-made Thai curries might include palm or coconut sugar to even out the spices. 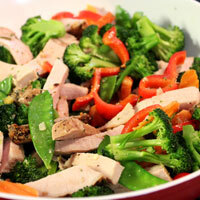 Opt for a stir-fry instead, and have it with extra vegetables rather than rice or noodles. Clear soups like tom yam are fine. Italian restaurants are a den of temptation for a low-carb dieter, with all those pizzas and pastas. 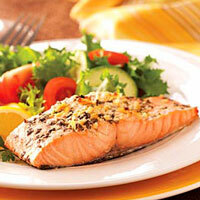 Avoid looking at them, and you might find some protein-based dishes like grilled meat or seafood. 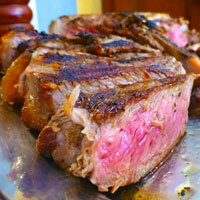 Bistecca alla Florentina would be ideal – a very fatty cut of steak. Antipasti like charcuterie plates, carpaccio, olives, mozzarella and tomato salad, are fine. 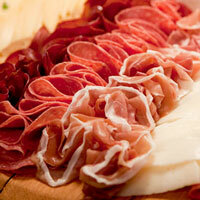 The Spanish love their meat, so low carb options are very easy. Whether ordering tapas or main courses, there should be plenty of high protein, low carb options. Watch out for paella and tortillas – these are high in carb. French cuisine relies heavily on fat, so there are many low carb options. Any dish cooked in wine is usually fine, for example, coq-au-vin or beef bourguignon. Entrecote is basically steak, so is a very safe choice. Shellfish and seafood are also good choices. 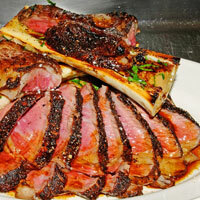 Cote de boeuf steak is fantastic. Watch out for anything cooked with béchamel or béarnaise sauce, as they are flour-based. Stay away from pastries and pancakes. Snails look innocent but are actually quite high in carbs. 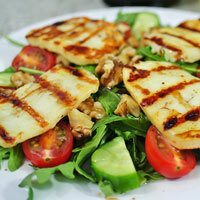 Middle-Eastern cuisine is big on meat, usually grilled over charcoals. There are many vegetable-based sides, salads and dips. You will be spoiled for choice. 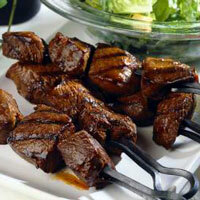 The easiest option is a meat kebab with grilled vegetables or a green salad on a side. Avoid pitta bread and rice. Guacamole is a great low-carb option for a starter, consisting mostly of avocado. 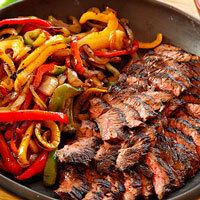 Any meat-based dish, like beef fajitas, that comes in a taco or a tortilla can be served on its own. 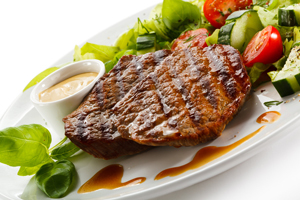 British and generic European food usually includes a chunk of protein like steak, lamb, grilled fish or chicken. Combine it with a salad or cooked vegetables, and you are safe on your carb front. Bread baskets, potatoes and desserts are of course to be avoided. Be very careful in coffee houses. All food and snacks available are very high in carb. A word of caution on the coffee itself. Milk contains carbs, so a coffee with a large amount of milk (like a latte or a flat white), could be high in carbs. Switch to a coffee with a smaller amount of milk, like Americano or Espresso. Soya milk has a lower carb content than cow milk and is available from most coffee shops. If a coffee house serves sandwiches or paninis, one possible option is to get one of those and discard the bread. A filling like ham and sliced cheese would be the easiest to handle.